In a large bowl or the bowl of a stand mixer, whisk yeast into 1 cup water and let sit 5 minutes. Add 3 cups flour and salt and mix, using paddle attachment, until just combined. Switch to dough hook (or remove dough from bowl and knead by hand) and knead on medium speed for about 5 minutes (10 minutes if kneading by hand), until dough is smooth and elastic. Shape dough into ball and place in a lightly greased bowl, cover with plastic wrap and let rise until doubled, about 1 hour. Punch down risen dough and divide in two pieces. Roll each piece into a foot-long rope and place side by side, about 3-4 inches apart, on a pizza stone or baking sheet lined with lightly floured parchment paper. Cover with lightly greased plastic wrap and preheat oven to 400°F. Once oven is preheated and dough has risen slightly (about 20-30 minutes), remove plastic wrap and slash each baguette a couple times using a very sharp knife. Place baguettes in oven, reduce heat to 375°F and bake until golden brown, about 20-25 minutes. The bread should read about 210°F with a thermometer when done. Remove from oven, spritz with water and allow to cool on cooling rack. I’ve been consistently baking bread for nearly two years. 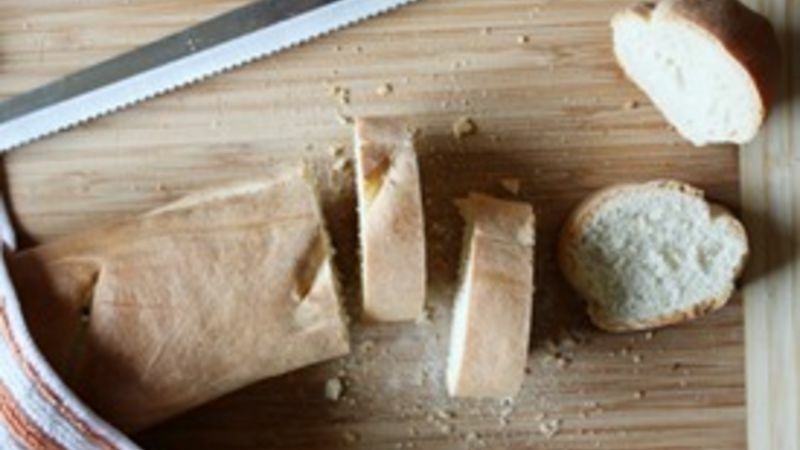 To the bread connoisseur or professional baker that’s a blip on the radar, but for me, it’s been a long, wonderful journey of learning how to make from-scratch bread in my home kitchen. I’m proud to say I have learned a lot along the way (though I still have much to learn). Of course, there have been plenty of moments of disbelief (“There’s no way I can make bread at home! Me? By myself? With my hands? No bread machine? Pssh, please.”), spills and tearful moments of impatience. I didn’t say baking bread is always a pretty process. But, with a lot of practice (and a lot, a LOT, of lessons in patience), I made homemade bread, and it was possible, and it wasn’t that hard, and I did have the time for it. A lot of people tell me they have no time to make homemade bread. And sometimes, I still don’t think I have the energy or the time to make it every week. But there are recipes like this fast French baguette that prove us all wrong. You can have yummy, fresh-baked bread on your table in two hours. Yes, TWO hours. It’s delicious, too, and very easy to make. What I love about this baguette recipe (besides its incredible speediness) is that the result is light and porous, just like a baguette that takes 24 hours to make. The bread does harden over time so it’s best to eat it right away, but even the crustiness of day-old baguette is perfect for toasting and topping with bruschetta or a tapenade. So, no excuses. Get down to business. We’ve got (yummy, easy, quick-to-make, very possible) bread to bake!